Just wanted to share this neat collection of photos from ex-Sleepyhead bassist Michael Galinsky, all taken at various malls in the summer of 1990. The fashions play more prominently than the malls themselves, but you can still get plenty of glimpses into a blur of Tape Worlds and Jarmans and Patrick Swayze posters. Mall department store junkies won’t find too much to latch onto here–the only anchor that features prominently is an old Sears, though I think there’s a “Harris” logo visible in the reflection of one shot. Can anyone identify the malls in these pictures? EDIT: Apparently many of the photos, if not all, were taken at the Smith Haven Mall on Long Island, which we’ve featured on the site before. It looks a little different now. Love the smokers and the future “Jersey Shore” reject. Looks a lot like Walt Whitman Mall judging from the mix of natural light. I can’t get the site the pics are on, to work. 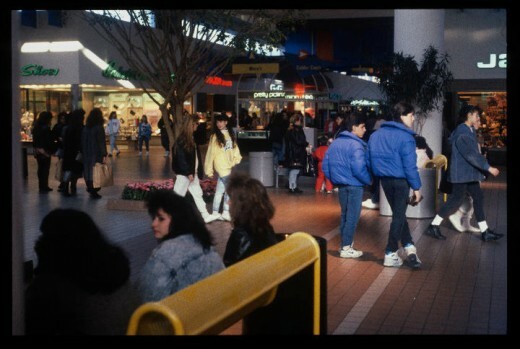 Most of these pictures were taken at Smith Haven Mall on Long Island. Must be in an ATT mobile area. No one is using their cell phones. Looking at these photos are there any malls left in the US where smoking is allowed? I know that just before our local mall decided to go smoke free some of the stores and restaurants around town had started their own “policy” when it came to smoking. One buffett restaurant it was strictly Marlboro & Camel only ( they claimed generic cigarettes had stank more ) while the arcade had said a no no to cigars and cloves. Then we had yet another restaurant that had an issue with menthol cigarettes such as Newport and KOOL because of their “odor”. Yes it is laughable now. Well it wasn’t very long before our county ( and the mall ) had got on the “no smoking allowed at all” train. Amazing collection of pictures. It’s amazing to me how you always see a different cycle of retail store logos, from the ones that retail stores use today. Not to mention, of course the different styles of clothing people wore back then, versus today! The wooden trim look you used to see on a lot of mall store facades is long gone(for the most part, unless you see an older unrenovated store somewhere), as well!